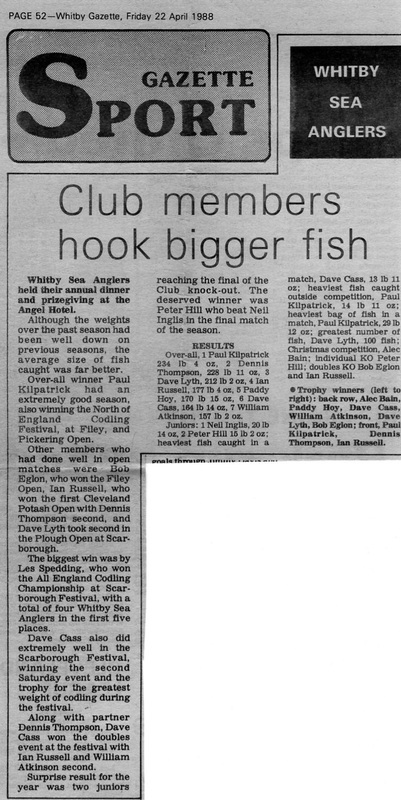 Singles Knockout winner - Peter Hill (Jnr) (taken from Trophy & press cutting at bottom of page). Singles Knockout runner up - Neil Inglis (Jnr). Doubles Knockout winners - Bob Eglon & Ian Russell (taken from Trophy). Heaviest Fish in a competition - Dave Cass - 13 lb 11 oz - 7th February 1988. Heaviest Fish out of competition - Paul Kilpatrick - 14 lb 11 oz. Christmas match winner - Alec Bain - 12 lb 06 oz (16 billets). Christmas match Heaviest Fish - John Messenger - 6 lb 00 oz. Greatest number of fish - Dave Lyth - 105 fish. Heaviest Bag of Fish - Paul Kilpatrick - 29 lb 12 oz - Wednesday 21st October 1987. 1st - Neil Inglis - 23 lb 6/16oz - 30 fish. 2nd - Peter Hill - 16 lb 8/16oz - 20 fish. 3rd - Rob Johnson - 2 lb 03 oz - 2 fish. Total weight for the season - 1,936 lb 10 oz. Total Number of fish - 859. John Messenger & Les Spedding - Heaviest Fish - 7 lb 01 oz. Denis Thompson Heaviest Bag 23 lb 03 oz. 21st October 1987 - Paul Kilpatrick Heaviest Bag 29 lb 12 oz. 8th November 1987 - Bob Eglon 1 fish for 7 lb 07 oz. 25th November 1987 - Denis Thompson 1 fish for 10 lb 13 oz. Open not dated in ledger - (later confirmed as 22nd Nov 1987). 2nd December 1987 - Dave Lythe Heaviest bag 26 lb 08 oz. 7th February 1988 - Dave Cass 1 fish for 13 lb 11 oz. 24th February 1988 - Dave Cass 1 fish for 6 lb 03 oz. 13th March 1988 - Paul Kilpatrick 1 fish for 5 lb 10 oz. 20th March 1988 - Denis Thompson 1 fish for 5 lb 09 oz. 27th March 1988 - Dave Cass 1 fish for 5 lb 08 oz. 30th March 1988 - William Atkinson 1 fish for 4 lb 10 oz. At the end of this season only 12 seniors were fishing and 1 junior. 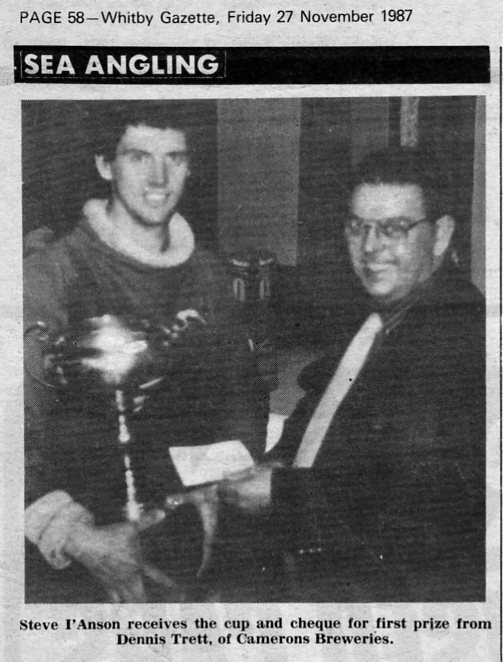 Seen receiving his trophy from Stan Hawcroft (Bass North area representative) is the winner of the Scarborough Fishing Festival All England Codling Championship, Les Spedding, of Upgang Lane, Whitby. Centre in the picture is chairman of the festival committee, Eric Appleby, who said the event had been a big success. The festival's boundaries had extended to Whitby in the north and to Flamborough in the south. Results included (addresses Scarborough are unless otherwise stated). All England Codling Championship (Angling Festival Committee Silver Challenge Trophy) - 288 competitors, 62 weighing-in. 1 - I Wilson 6-1-6. Sealed weight W Mason 4-11-6 M Woodyatt 2-5-12, T Shannon 4-11-4, P Mason 1-10-10. In the Marine Drive competition Whitby's R Eglon was placed sixth out of 137 competitors with 4-2-8. P Short of Guisborough, was shore angler with most most points (35), taking the Sim Rawling Trophy and £50 presented by Johnson and Fryer. That success also won him the Skelton Trophy and £25 for the visiting angler the highest points score. Short additionally bagged the WW Hodgson Trophy for the visitors aggregate weight for the week (45-10-4) and the Scarborough Townsman's Association Challenge Trophy for the heaviest single fish (shore) taken by a visitor. Whitby angler D Cass carried off the Yorkshire Evening News Championship Trophy, for aggregate for week all-shore events (61-9-2) and Les Spedding won the Mabel Massheder Memorial Trophy for the heaviest single catch of cod by a local angler in a shore event (36-1-14). Whitby anglers also did well in the team category. D Cass and D Thompson took first prize with 54-0-5 and I Russell and W Atkinson second with 30-13-14. *Heaviest Fish 7 lb 01 oz. The 7 lb 07¼ oz cod held by Bob Eglon, of Whitby, won him the top prize of £200 in Filey Brigg Angling Society's annual one-day open match, sponsored for the first time in the society's 65-year history by John Smith's brewery, at the weekend. Second prize went to Andy Cammish, of Filey, for 6 lb 13¾ oz specimen (£75), and Les Spedding, of Whitby, came in third with a cod weighing in at 6 lb 13¼ oz (£25). The heaviest flat fish was a 1 lb 05¼ oz flounder landed by the society's secretary, Ken Carpenter, and the heaviest fish caught by a lady was a 4 lb 02 oz cod landed by Gail Colling. 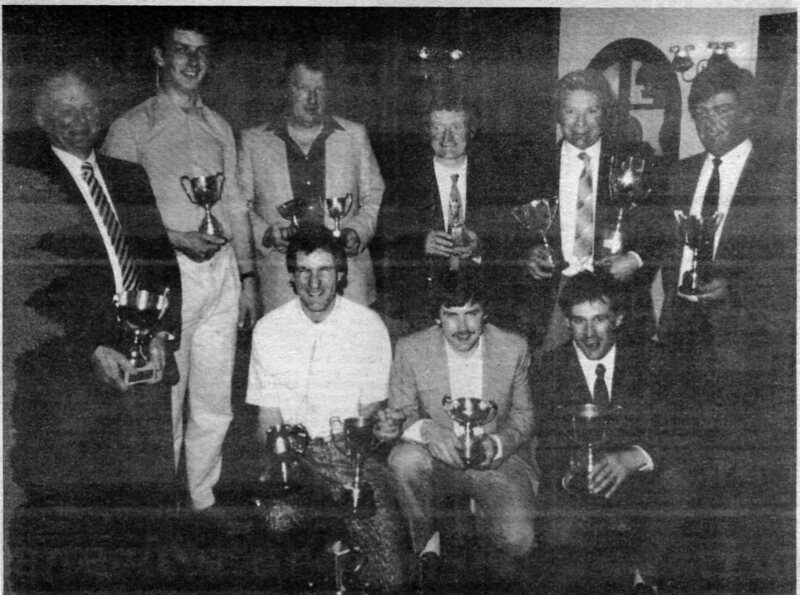 They were all presented with their prizes by John Smith's sales manager Steve Cannan, from Tadcaster, at the Grapes Inn, Filey, on Sunday night. L-R (front) Mr. Spedding, Mr. Eglon and Mr. Cammish. (Back) Miss Colling, Mr. Cannnan, society president Jack Taylor and Mr. Carpenter. L Spedding and W Atkinson were placed third, fifth and seventh. 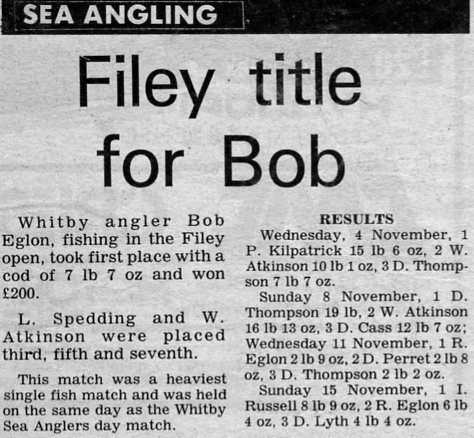 This match was a heaviest single fish match and was held on the same day as the Whitby Sea Anglers day match. * Heaviest Fish 7 lb 07 oz. On Sunday, Whitby Sea Anglers held their annual open fishing competition which attracted a record entry of 145 competitors. Sea Conditions on the day were ideal for good fishing and 44 anglers weighed-in a total in excess 300 lb. The weigh-in was held at the Pier Hotel and the prizes were presented by Dennis Trett, of Camerons Breweries, who, along with Blue Star Angling, were the main sponsors. Steve I'Anson of Scarborough, took both cup and prize for the highest total weight of codling and the cup and sweep for the heaviest individual fish with an incredible bag of 15 codling weighing 51 lb, the largest of which was 8 lb 11 oz. Second place went to Graham Igo, of Redcar, with seven codling weighing 26 lb and the second heaviest individual fish was caught by Dave Medd, of Scarborough. Thanks to donations of various local businesses, the prize list extended down to 35th place for aggregate bags of fish and two special prizes heaviest fish by a WSAA member and the heaviest fish other than a codling were won by Bob Eglon and Rob Harland respectively. Rob Harland (Whitby) 1 lb 04 oz flounder. 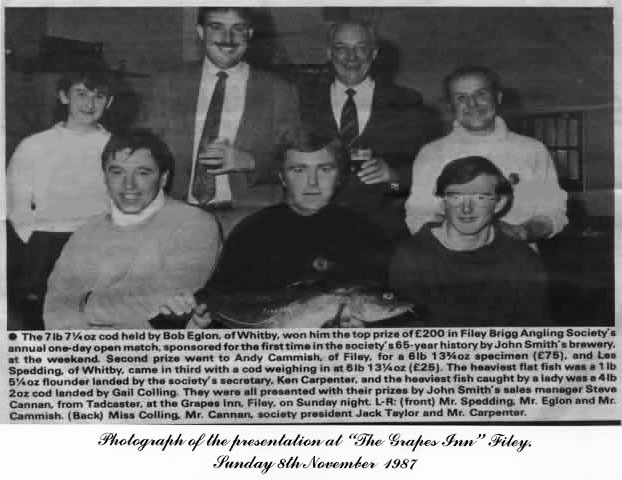 Sun 22 Nov 87 - Whitby Sea Anglers Association Open. * Heaviest Fish 10 lb 13 oz. Sun 20 Dec 87 - Christmas Match. *Heaviest Fish winner John Messenger. Christmas Break - Weights so far. 10 seniors fished and 2 juniors. Sun 17 Jan 88 - Eric's Open. 7 members fished, 5 members weighed in, average 1 lb 13 oz. Sun 28 Feb 88 - 50mph gales. Whitby Sea Anglers held their annual dinner and prize-giving at the Angel Hotel. Although the weights over the past season had been well down on previous seasons, the average size of fish caught was far better. Over-all winner Paul Kilpatrick had an extremely good season, also winning the North of England Codling Festival, at Filey and Pickering Open. Other members who had done well in open matches were Bob Eglon, who won the Filey Open, Ian Russell, who won the first Cleveland Potash Open with Denis Thompson second, and Dave Lyth took second at Scarborough. 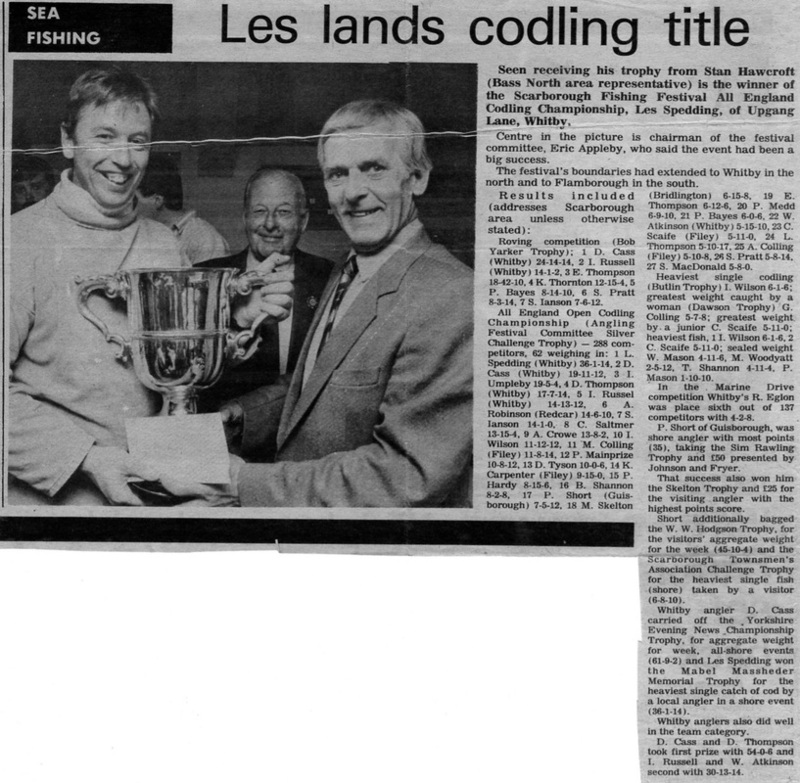 The biggest win was by Les Spedding, who won the All England Codling Championship at Scarborough Festival, with a total of four Whitby Sea Anglers in the first five places. Dave Cass also did extremely well in the Scarborough Festival, winning the second Saturday event and the trophy for the greatest weight of codling during the festival. Along with partner Denis Thompson, Dave Cass won the doubles event at the Festival with Ian Russell and William Atkinson second. Surprise result for the year was two juniors reaching the final of the Club knock-out. Te deserved winner was Peter Hill who beat Neil Inglis in the final match of the season. Paul Kilpatrick 14 lb 11 oz. Paul Kilpatrick 29 lb 12 oz. Greatest number of fish- Dave Lyth 100 fish. Christmas competition - Alec Bain. Individual KO - Peter Hill. Doubles KO - Bob Eglon and Ian Russell. Completed and posted 9th August 2013 PDH.